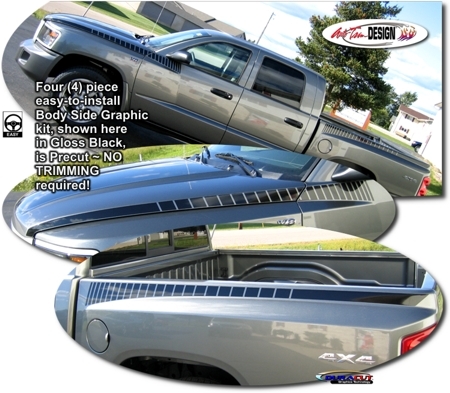 Trick out your '05-Current Dodge Dakota with this retro style Body Side "Strobe" graphics kit. This easy-to-install four (4) piece kit is packaged as PRECUT pieces which are ready to install in a wide variety of colors - NO TRIMMING required! Kit is specifically made for the '05-Current Dodge Dakota and will not fit any other vehicle. Graphic is designed to follow the Dakota's distinct body side lines as shown.